This guide will navigate you through the overarching trends impacting event marketing. Discover what tech, best practices, and social tools will help you win more attendees in 2019 and beyond. 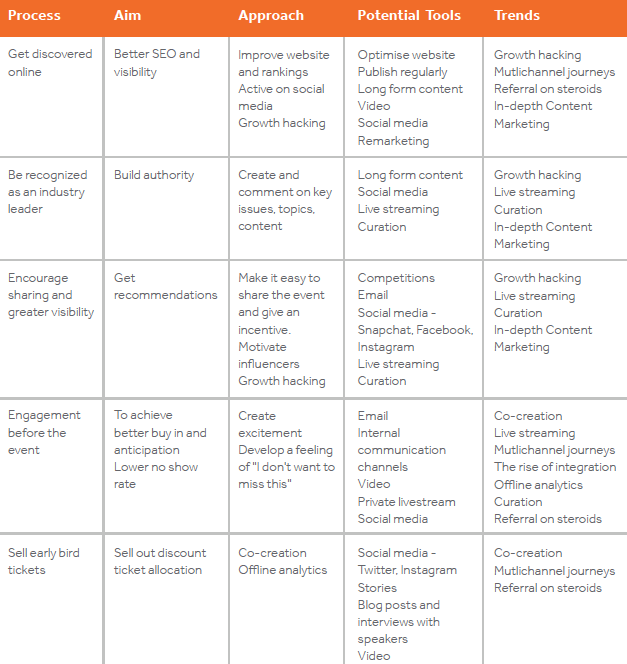 This guide will tell you what matters now in 2019 and what will matter going forward in event marketing. We feel it is useful to let you know about the big shifts happening online and offline, so you can market your corporate events, brand activations, client conventions, trade shows and team building activities better and more efficiently. We are all familiar with adoption rates of social networks and online communities. When a tool becomes popular, it profoundly affects the way we will consume experiences and products. There is no time to think whether our audience will care. Social networks will adjust to include the hype; it will become part of the way we do business from now on. How does that affect corporate and business-oriented environments? We may be tempted to think that this does not apply to our reality. Open rates, click through rate, and direct conversions are going down. To succeed, the event marketer of the future needs to stay on top of the event marketing game. What is your objective? Are you trying to get more people to attend your events? Are you planning to engage them more? Do you want to create a year long engagement and a community around your event? These are universal questions that affect every event marketing plan. The good news is that there is an answer to these matters. What makes the difference between a good and a great experience is your knowledge of what is happening now. The first section discusses trends affecting the way we market our events internally and externally on the planner and attendee side. The second section looks at how can we reshape our strategy to accommodate for change. The third section looks at the tools that will allow us to incorporate trends and objectives into our day to day practice. What may often be a buzzword for those operating in digital marketing is becoming synonymous with a scientific approach for how to do online marketing. Marketing events is no different. Savvy event marketers take offline and online marketing with an analytical approach. Gone are the days when awareness was the only proposition sold by media and advertising outlets. Growth hacking refers to an analytical approach that favors small scale, less expensive experiments to prove a (marketing) point that can be later expanded into a full marketing program. As budgets globally shrink, event marketers focus on those offline and online tools that deliver value, they test different alternatives and roll out small scale campaigns to gain immediate feedback from customers. Growth hacking is a philosophy that relies on a specific set of tools, therefore it will be crucial to refer to the Tools and Tactics section for some of the most reliable tactics to implement in 2019 and beyond. The biggest secret of the event industry nobody talks about. After conducting research with 1,600 event professionals and having looked at most of the literature on the subject of engagement at events, we can confidently say that co-creation will be the most surprising trend to watch in the next 12 months. Co-creation bridges the gap between marketing and engagement at events. It is the number one driver for satisfaction, and it is also the number one motivator to get attendees to create content at events. Particularly in corporate environments we often complain that attendees are bored, they sit down unimpressed over 3/4 of the event, checking their email. The answer to raising the level of engagement of these stakeholders is to get them involved in the event well before the event starts. Meaningful networking and matchmaking are the tools that will secure effective marketing and incredibly high satisfaction rates. We can see the reaction of half of you reading this. You are thinking, I can't do this in a corporate environment. The same pretty much happened in 2008 when social media came along. Corporate events are now successfully using social networks to engage attendees and market to them. Social media is turning into live and video. The way you use it with your performers and stakeholders is essential to market your event properly. The aforementioned is an invaluable marketing trend but also a powerful engagement one. Attendees are increasingly reaching out for their phones and they don't take pictures anymore, they hit the 'live' button on platforms such as Facebook Live or Periscope and start streaming. They do it to connect their network and audience to the event. This can be a valid option even when an event has sensible content or is not open to the public. Many, many tools offer private live streaming channels to involve remote attendees in a secure way. If you work with email marketing, you know it. Sending an email rarely converts into direct action. Many report the average customer journey before a decision is made is between 9 and 16 interactions with a brand on different channels. That means that before an attendee makes the decision to register, they may interact at least 9 times with your brand in different ways and means. That translates into being ready in every channel relevant for your audience. Whether it is Facebook, Snapchat, Twitter, Email, Website, Phone (or Fax), you need to be there offering the same experience, branding, and voice. The event industry has talked about strategic meetings management (SMM) for a while. This has been one of the most effective approaches to make sense of meetings and events in large corporations. Even more so if you are an event marketer. Times are now mature to use tools that offer a state of the art suite of tools, covering in a dynamic and user-friendly experience all aspects of event planning, tying all data together for stronger decisions. If such solution don't offer e.g. engagement or venue searching options, they need to integrate with tools that do. SMM will probably never be mentioned again, but it is happening in practice. Smart event marketing professionals select tools that talk to each other and make sense of the incredible amount of data coming from each dashboard. There is no excuse not to have offline data about how attendees engage with your event and your sponsors. Selling and marketing events means keeping all parties happy. For too long we have not used offline data strategically to generate more sponsors and more attendees the next year. Using tools such as beacons (Bluetooth Low Energy) and NFC, but also mobile apps and live response tools, we can rely on a complete suite of tools to analyze the impact of our marketing and sponsorship activities. Analyzing and digesting this data will define our marketing and sponsor engagement strategy for the future. The future of event marketing is not about reporting to your boss or stakeholders that everybody enjoyed the event. Event professionals, especially in corporate environments, are becoming curators of communities. They are the catalysts of the conversations, content, and connections happening in a group of people. Their job is to understand these dynamics, collect them, analyze them and then expose them in the marketing of the event. Discovering the new influencers in an event and giving them exposure is just an example of being a community curator. It may well be likely that one of the roles of the future will involve a Crowd-coordinator, someone that takes care of content from the crowd and makes sense of it for the business. The same applies to connecting attendees before the event happens so that they can start enjoying the benefits of serendipitous networking, while actively supporting the event. This outcome has often being defined as evangelism, the event marketer is the enabler of such a process. There are a new set of tools that elevate the power of referrals in events. Offering links to share an event on social media is not enough. How can we leverage the network of our attendees to stimulate participation? This is one of those atavic questions that impact corporate event marketing and that we need to embrace fully in 2019 and beyond. Being community curators and enablers means taking full advantage of the tools that allow a ripple effect within online communities. Social networks are mature enough to integrate with a multitude of tools that will give you unprecedented intelligence to create more opportunities for smarter referrals. This is the case with internal referral programs that benefit from the significant adoption of social networks. 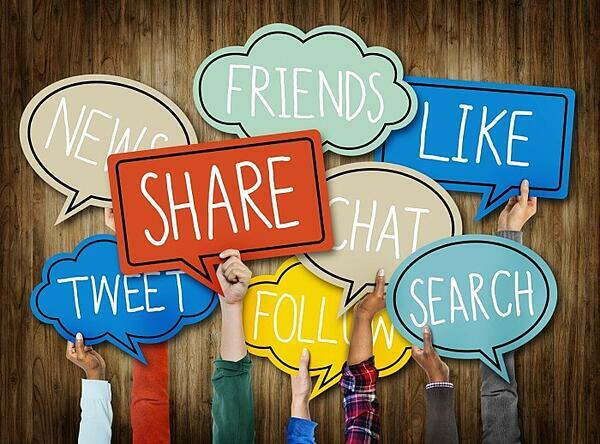 As we are increasingly more used to spreading the word on social networks, we may well do the same within our company. This concept is especially valuable if you work in large organizations or with volunteers..
We've all witnessed the power of content to support marketing activities. Content marketing has its loyal legion of adepts. We all love it, we all do it. But is it enough? In a sea of incredibly shallow and superficial brand content masked as 'valuable insights', we really need to step up the game of our content offering. If you work with corporate audiences and the C-level suite, you will know what we are talking about. The right mix of engaging, valuable, trustworthy, content is always welcome. But does not suffice. Multiple signs are saying that well-researched, data driven, in-depth, analytical, long-form content is winning the online game. Dressing up 10-slides as a report does not work. You may capture leads once, but it is unlikely that you will have any positive results going forward. Marketing teams should be formed by individuals that know the verticals they are working in and can offer powerful content to the audience of the event. Whatever its form, video, text or images, delivering superficiality will not make an impact. The starting point for any event (or organization, or project) should always be WHY? The answer to this question outlines the key objective that will determine the success, or otherwise, of the event. This is the criteria against which the event will be measured back to. This is the defining factor which will help communicate and determine the marketing strategy. Why should people attend your event? It isn’t about you. It is about the value to the participant and other stakeholders. What is in it for THEM? How does your event meet their needs? What are their pain points? How can your event solve a problem or offer a solution to them? Listen closely and think carefully about the benefits of attending your event from the attendee perspective. How will it bring value to the customer? Simply listing speaker names and features for your event (100 exhibitors, 20 keynote speakers....) is not effectively communicating a reason to attend. Often there are complex motivations for attending an event. Some of the reasons people will be happy to admit (‘I need to learn a skill’) and other reasons people prefer to keep to themselves and will not share (‘it sounds like a nice jolly’). Both public and private reasons are valid. Consider how to appeal to different overt and covert motivations people have for attending an event. Make the benefits clear and simple. If potential attendees don’t understand the offering they will switch off. They will not spend time looking for a reason to attend an event if the advantages are not clear. On the other hand, if you can capture their attention by giving a possible solution to their troubles they are more likely to sit up and listen. Your strategy also needs to focus strongly on other stakeholders such as sponsors, event partners and exhibitors. How can your event help them to meet their objectives? Sponsorship packages, exhibition space and other revenue generating activity will be easier to achieve buy in for if you consider everything from their perspective. An event elevator pitch is a succinct summary to explain your event to someone without any previous knowledge of it. It is an opportunity to capture someone's interest and understanding. Think about the best way to communicate the vision and benefits of your event in a couple of sentences, or in 60 seconds. Social media offers a fantastic opportunity to test and measure the success of your messaging to see what resonates the best. By using this growth hacking approach on your social media channels, you have a low cost opportunity for experimenting and nothing to lose. Refining your event elevator pitch is an essential and worthwhile exercise. Once defined it should be communicated to all your major stakeholders to ensure everyone is sending out a coherent message. Any opportunity to succinctly share details of the event and act as an ambassador should never be missed. "Only five exhibitor spaces remaining." "The event highlight of the year is here." In the event industry we are guilty of using the same messages and call to actions over and over again. We zone out after hearing the same thing time and time again, so banish these outdated messages and try to slice through the noise and clutter. There is no excuse to not change now. As we suggested, the future is now. You can make a strong impact now. Keep messaging clear and simple and always focused on your value proposition. Don’t use jargon. Speak the language of your attendees and stakeholders. The better you understand your audience and investors the better your events will be and the easier it becomes to tailor your message accordingly. 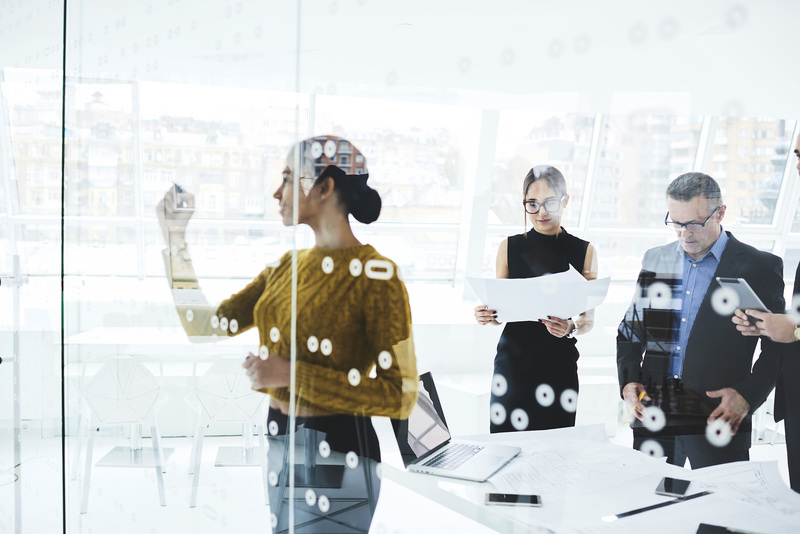 One way to improve your communications is for your organization to develop five personas, which represent your core attendees and stakeholders. For each character you should think about their motivations in terms of attending the event, their fears, goals and pain points and what your event can give that will offer them true value. The characters should be created from a combination of educated guesses and data. As you gather more data the personas can develop and become more factual using offline analytics such as beacons, NFC, survey data, Google Analytics, mobile apps, live response data and other tools. Think about a specific elevator pitch which will appeal directly to each persona you have developed. Set a consistent message on how to sell your event to this specific stakeholder and start to segment your audience accordingly to enable you to increasingly personalize your communications. Look critically at every social media post, piece of content or email you plan to send from the point of view of the recipient. Consider what outcome you want to achieve and think about why the recipient should even care and what reaction or action you can realistically expect. If it has a weak message it is unlikely to break through the noise and clutter to resonate with them. Throughout your attendee journey you have numerous touchpoints with your participants and stakeholders before, during or after the event. By understanding these touchpoints within the event life cycle, you can gain a better understanding of marketing opportunities, as well as the opportunity to increase satisfaction along the way. Think about all the ways a stakeholder may come in contact with your brand. To help formulate this better think about different scenarios and the steps they take. Where does the journey start and what are the paths of entry? Record online and offline steps from the marketing and preregistration stage, right through to the post event survey and follow ups. You should record both major and minor touchpoints. Every step and decision that may have influence over the attendee or event partner. Using post-it notes is a good way to map it out and refine the journey initially. To explore and better understand your stakeholders is a valuable exercise always. The journey can be complex but even if it is only done on a simple level initially it can still be very revealing. You can then develop and build up from the basics. It isn’t just the direct interactions with your company which have an influence either. Other indirect factors may funnel the attendee on the path towards your event, such as searching for management training and finding your event fits their criteria, noticing that a contact is exhibiting at your event, checking out the what's on guide for a local venue or realizing that an influencer they want to hear is talking at your conference. It could be several factors combined which tips the balance over to the decision to attend but understanding these triggers helps to perfect your marketing strategy. Even if you are planning an event with expected or guaranteed attendance, such as an internal team building retreat, a CPD (Continued Professional Development) training course or a company annual meeting, you still want to reach a tipping point for buy in from your attendees. Although guests in these instances do not have to be persuaded to buy a ticket, if you can achieve some anticipation and engagement prior to the experience they are likely to get more from it and the dropout rate will be lower. Considering every touchpoint along the journey will help to identify gaps, strengths and weaknesses to enable improvements to be made to your marketing offering and communication strategy. It may enable you to streamline and speed up the process to make it simpler for the attendee and quicker to reach the tipping point to convert the potential attendee into a confirmed participant, or to encourage them to engage more closely with the experience to follow. Once you have mapped out the attendee or stakeholder journey you can identify key elements and cross roads in the process. Process mapping will help crystallize how to influence specific outcomes and start to develop the strategy behind what you want to achieve. This exercise will also identify where potential tools can be used and their primary purpose. You want different channels to be used effectively and indifferent ways, rather than broadcasting the same message with a broad-brush approach across all platforms. Each channel identity and purpose can then be refined. It is unlikely that someone will take action the first time they hear about your event. Effective frequency is the number of times a message needs to be heard before someone takes action. This could be buying a ticket or enquiring about the possibility of exhibiting at the event. There are lots of studies about what this magic number is and many marketers swear by the rule of 7. However, for the entertainment industry the average touchpoints needed is actually 9.5 and for not for profits this rises to an average of 16.3. If you can determine and plan numerous touchpoints for stakeholders to encounter your event marketing you vastly increase your chance of a successful sale or engagement. Of course, the result is not guaranteed but it is always wise to plan to surpass the minimum number of touchpoints required to trigger action on behalf of the stakeholder. By conveying a strong message, you can build trust and familiarity with the potential participant, sponsor or exhibitor. Ensure that potential attendees and partners can find you and that you can give reminders to those that have the event on their radar but haven’t yet taken action and booked their place to attend or exhibit. If it is a paying event you need to give enough reasons for people to find a way to register. If someone is unsure you haven’t yet proved to them the value of attending and you need to work harder to convince and reassure them. If planning an event with expected or guaranteed attendance you may have to work even harder to be heard in advance as your guests could view it as low priority and something to be shelved and not thought about until the day. In terms of your event you will need to consider how you can inspire attention or provoke thoughts or action ahead of the actual event. For both of these circumstances, being on trend and using new tools can be an effective way to stand out and get noticed. By earning respect as an innovator, leading the way and doing things differently, you can inspire those involved in your events and hook them. Make a strong stance that this is not a repeat of previous events and demand full attention for the journey ahead. The stakeholder journey should look at the flow and experience of the attendee and other partners before, during and after the event. It is a complex route map and it isn’t just about when a participant buys a ticket or commits to attend the event. There are lots of influencing factors which impact on the whole experience. Although for event planners the primary marketing goal is often persuading someone to register the touchpoints throughout the event process can strengthen synergy, engagement, excitement and loyalty your brand. Improving the overall experience and interaction makes it more likely fora participant, exhibitor or sponsor to recommend and repeat attend your event, helping to build a customer for life. Event planners and marketers have never been in a stronger position to attract and keep event attendees and partners hooked and coming back time and time again. By using an integrated dashboard and tools such as beacons we can access joined up data and link it to a wider picture to illustrate the attendee journey. We can identify the possible touchpoints and opportunities to reach them and other stakeholders across multiple channels. By defining realistic personas, we can develop and refine our messaging, which can then be tested intelligently through growth hacking techniques. It is easier and more cost effective to encourage someone to return to your event, rather than finding and recruiting a new attendee or headline sponsor each time. Keeping the conversations going all year round and building a sense of community around the shared interests and vision of your attendees is a wise strategy. Listening and observing your attendees and event partners can enable you to react and pre-empt issues, as well as providing insights and learning for how to improve future events. Never before have we had such opportunity to listen to our stakeholders, understand them and take action based on actual evidence. Event planners have the opportunity to involve them more fully in the whole event experience, for instance by co-creating the conference programme, voting on the event destination, and getting honest input into some of the event decisions. Likewise, if a sponsor and exhibitor can see the valuable relationships and communication around the event it will be easier to get them to sign on the dotted line. This level of engagement and buy in is what will truly define the success of your event from the perspective of all stakeholders. If you are reading this report you care about your events, about everyone that has invested time and money into the event, and you want to do things better. The trends, tools and tactics within this report reveal some of the immediate opportunities to empower event planners to unearth and cultivate loyal attendees, sponsors and exhibitors. marketer engages an online ad agency (or directly through Google) and puts a specific tag on their website. Those who view that page will find a targeted piece of advertising seemingly following them across other websites. With remarketing, the major step of visiting your website can turn into a series of touchpoints on engaging platforms like Google, YouTube, and Facebook and lead to a conversion. As we’ve discussed how journeys are becoming longer before action, remarketing is your strongest ally to deliver a consistent and persistent message across the web. Remarketing has a lot of value for B2B companies, since initial acquisition of a niche consume is more costly and difficult to achieve. Create an ad for those who visited a specific speaker bio page with their topic in the title. Make a remarketing ad for each trade show exhibitor or sponsor by giving them their own pages on your site. Include that in your package offerings. Create a countdown to early bird registration deadlines in your copy to make for a stronger call to action. Unlike the distasteful pop-ups of a decade past, modern lightbox-style pop-ins won’t be blocked by blockers and won’t significantly impact bounce rate. Website visitors are trained to know that simply clicking the X in the box will allow them to go back to your site. Pop-ins are most commonly used to drive visitors to sign up for your email list but can be used for any desired additional actions such as app downloads, coupon downloads, and social media following. One of the core principles of growth hacking is making every attempt to use the most amount of inexpensive touchpoints to drive towards a conversion. Pop-ins are just the right level of behavior that doesn’t cross the line of being seen as aggressive but gets the job done. Make sure your call to action button is a different color than your background, is centered, and is clearly stated. Make a trade. If you want something special from your visitors that requires a pop-in, give them something special in return. Be as concise as possible. A visitor should be able to read the entire pop-in in 5 seconds or less. Offer customer support on pages with lots of copy after they spend more time than the average time someone spends on any given page (based on your analytics). Sell your keynote speaker’s book to all those who register and offer a bonus ebook or companion update. Ask why they would consider attending your event with three options leading them to three different pages made up for their very specific needs. This style of pop-in are an even more sophisticated variation of call to action visitor interruption. They are triggered by a visitor’s behavior, often as a last ditch effort to convert before they leave a page or your website. Time-based. These drop in after a certain amount of time is spent on a page. How much time someone spends on any given page is a telling way to determine how interested they may be in what you have to say. First-time visitors. Your first impression is often the most crucial. Deal with common misconceptions or quickly endear yourself to these visitors with the best you have to offer. Abandoned carts. With e-commerce products such as ticket sales, there’s nothing more frustrating than an abandoned shopping cart. Remarket those who left before completing the sale with an ad that offers a percentage off within a short window. Add-ons. If you have a registration page, pop-ins for additional complimentary items are a way to turn a smaller sale into a larger one. It seems like every social media platform has been building towards video as the content category of choice. This is the result of more sophisticated technologies to support streaming video as well as user’s fatigue towards being communicated to through words. 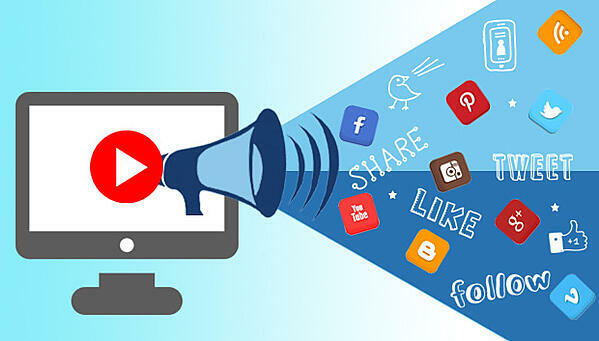 With every major social media channel investing in video, it’s important to understand the pros and cons of each platform to determine where it fits into your strategy. Remember that the key to all video content, no matter the platform, is that it needs to be visually appealing and should be kept short. Video uploaded directly to Facebook seems to have a positive effect on its feed ranking based on the Facebook algorithm. Other positive metrics for Facebook videos include an increased volume of engagement over photos (with the additional metric of views being counted) and longer sustained engagement. Tell your story with and without sound in order to capture the attention of those at work or listening to music. The first 10 seconds are the most important. Make sure to hook people with a unique angle they can’t help but continue with in order to see the resolution. Use video insights in order to determine the ideal video length for your audience. Snapchat’s preferential front-facing camera is due to its users’ interest in intimate experiences in real time. You can afford to be as real as possible on Snapchat videos. Behind the scenes resonates better than perfectly composed depictions of reality. Make it fun. This is the social media of goofy facial filters and animal stickers. Don’t take yourself too seriously. YouTube is as much a video hosting platform as it is a search engine and social media site. The rules of all three should be taken into consideration. Make sure to use the keywords that attract the right searches to your videos as you would when you write SEO copy for your website. Production matters more here. While raw and uncut looks are appealing to some platforms (especially live streaming), these videos will have a longer shelf life and should be more composed. Make sure you have a compelling call to action with more content similar to what the person just watched in order to convert to your website. Keep videos short, between 1 and 2 minutes long. Consult your business analytics to tell you when you should be posting on any given day. Use third party utilities to add captions to your videos for those who scroll quickly through their feed and have sound turned off as their preference. Your feed videos should be less raw than Snapchat but doesn't need to be as composed as YouTube. Use Instagram stories too for less than perfect and in the moment video that won’t benefit from being discovered after its 24-hour shelf life. Any technology that concerns itself with “live” makes it immediately relevant for the event industry to understand. With each update these streaming platforms become more and more identical except in one way they never will –user bases. Determining which technology to focus on should start with figuring out which social ecosystem is more beneficial for you to take advantage of. Videos on YouTube have a greater likelihood of being discovered over time. Live stream viewers react to sincerity over polished performances. Focus on personality over scripts. Build anticipation through FOMO (Fear of Missing Out). While often part of a campaign, each major live stream should have its own microcampaign. In an age of on-demand content, promotion of live stream content needs to emphasize engagement only available at the time given. This isn’t broadcast TV, this is a social media. Streaming viewers react strongly to having their name called out and answered in real time. Make sure that your viewers are acknowledged. If possible, include subtitles or work safe captions on videos for those who would watch but can’t benefit from audio. For event live streaming, both Periscope and Facebook Live have stated that a minimum of 10 minutes and a maximum of 90 minutes is ideal. Remember, viewers will drop part way through and others will come in midstream, so reiterate the context of what they are seeing. The origins and initial adoption characteristics of users for Snapchat did not hint much at its potential for use during corporate live events but this social media is evolving in that direction. While other social media platforms have all found their place as tactics for specific event marketing or engagement strategies, Snapchat is just now emerging as a contender. Passionate user base who spend more time on Snapchat than any other social media. Like events, Snapchat stories are temporary, and its fan’s engagement is fueled by FOMO. Robust and fun one-to-one communication is ideal for attendees to ask questions of a brand during a live event. On-Demand Geofilters offer an event a branding opportunity more contextual than a hashtag. Is there an upcoming event where the audience would be very receptive to your event as well? Set up an On-Demand Geofilter available at that specific location during the hours of their event. Read the rules carefully. You cannot use calls to action, hashtags, or usernames and there are a lot of design rules you will need to follow. An example of guerilla marketing would be a trade show exhibitor buying a geofilter for the whole exhibition space listing their booth number. These filters offer unofficial marketing opportunities far cheaper than event sponsorship. Especially with Snapchat’s core demographic, a brand’s ability to be real, transparent, and talk directly to them is vital for conversion. For many who put on corporate events, this type of connection is difficult. Showing behind the behind the scenes work that goes into putting on your event is an excellent way to build anticipation. With “Snapchat Takeovers” other contributors to the event can become the temporary voice for the brand and give your audience new perspectives. Your account can be taken over by a presenter, contributing vendor, or even a different member of your planning team. Beacons are strategically placed pieces of hardware that relay messages via Bluetooth to connected devices. When integrated with a conference app, messages can be pushed to attendees based on their proximity to specific beacons. There are endless possibilities when you can automate communication based on location context. Using show traffic pattern data, you can make adjustments mid-show (if possible) to divert traffic but more often, it’s an incredible tool for sales towards your next event. As long as you are using the same footprint, a show producer can sell exhibitors a tiered rate of exhibition placement based on real data. An additional upsell (or value-add, depending on your packages) could be the results of data analysis of attendees’ interactions with their booth in order to help them with their conversion strategy and booth design. If your meeting or event features elements that guests can walk towards and then walk away from, that’s important data when planning future events. Let in-kind sponsors know how many attendees and the demographic makeup of who saw their contributions in action. If you have a variety of entertainment acts occurring simultaneously, you can determine which was the most engaging to this audience. Smart badges are light-weight devices, often attached to lanyards, that allow attendees to passively exchange information with beacons during an event. They are particularly helpful at large scale multi-room conferences and especially at trade shows. They are superior to even bluetooth enabled apps because they do not eat up your attendees data plans and phone power. 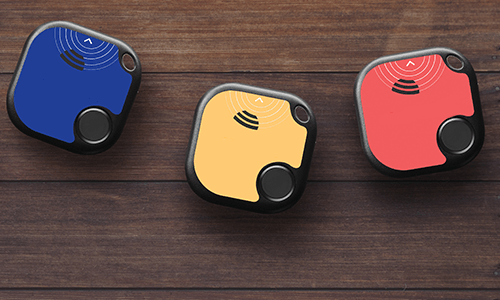 Smart badges relay information between beacons collecting and sharing data to assist with wayfinding, recording interactions with vendors, and even networking matchmaking. Smart badges are the most powerful tool of offline data analytics available for events right now because they passively collect hundreds of interactions that can make the difference between successful ROI for a sponsor, exhibitor or an attendee. They also deliver the horizontal interaction need we have to co-create experiences, one of the strongest trends for the coming year. Offering a tier of your sponsorship or trade show exhibiting packages that allows the sponsor to push notifications to attendees as well as data collected and analyzed about how their booth was interacted with is a very lucrative value add. This is an especially good technique for in-kind sponsors who don’t have a sales presence at an event. The personalization strategies discussed earlier are fueled by data through smart badges. Different personas can receive unique push notifications, information exchanged to and from trade show exhibitors as well as more customized communications from sponsors. Make sure your sponsors and/or exhibitors are aware in advance so they can create more unique targeted messaging for specific segments. These personas have amazing potential for speed networking sessions as well. Call it an article, white paper, report, blog post or even a guide, in the age of 140-character tweets, what place is there for long form content in your marketing? The answer lies in knowing your audience. The more niche you can get and the more value you can provide that niche, the higher likelihood of success with longer form content. Your brand’s social media content is the appetizer, but your long form content can be the meal they are looking for. You have to focus on writing something no one else could, to groups no one else is writing to. 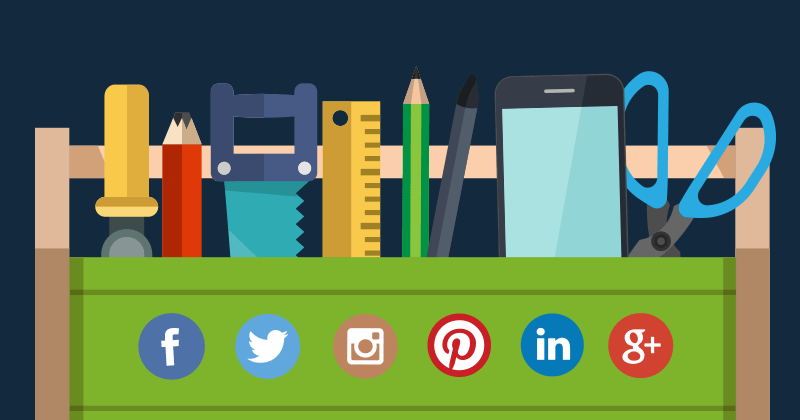 Create graphics optimized for the platforms as part of your posts. Include the titles and event quotes prominently on graphics used on Twitter and Pinterest and use image copy taking up less than 20% of the surface on Facebook and Instagram. Videos can more easily explain complicated ideas where you feel you might lose someone with copy only. In addition to clearer explanations, you will also drive up the amount of time readers will spend on your website (which will help with a number of things, including SEO). Take something everyone is talking about and extrapolate lessons from it that apply to your niche audience. Example: “What Game of Thrones Can Teach You About Stage Design”. How have the tools, strategies, and aspects of what your readers care about changed in the past 6 months? You can provide everything they need to know about recent changes in the areas you are the authority on in order to create dependence on your point of view and expertise. In every industry there are shared problems that everyone talks about when they get together but are not put out in the open for analysis or discussion. Take on the challenge of being the firebrand and establish yourself as a progressive solutions oriented leader. Rapid unsustainable practices are the product of poor growth hacking techniques. Buying followers in order to trick people into thinking you are credible, and most forms of content automation will hurt rather than help any strategies that are based on long term success. Web-based applications such as Tweepi allow you to target the followers of competitors or influencers in order to rapidly build your audience. Targeted automation of post liking on platforms like Twitter and Instagram also often result in fast follower gains without being seen as a spamming technique (as with post commenting automation). If your main goal is website conversion, social media posts geared at reeling people in for the full story on their site is key. Steer clear of clickbait schemes by focusing on value in your post with additional value on your site. Enticing graphics will help convert clicks and variations of images with different takes on the calls to action will also stretch out a campaign. For example, if you are sending them to a list, give them one of the items in your post and have the rest located on your site. Social media tactics are the best forms of growth hacking because you have the opportunity for impressions you don’t pay for through social sharing. Social media posts designed to entice followers to share them takes precision. Self-promotion and ads are rarely shared or retweeted unless you have something that is ending very soon and exclusive. Timely posts that leverage moments everyone's talking about are overwhelmingly the most shared content with instructional content being second. Direct your tweets at influencers with unique messages to them (but please space out requests so they feel special and not blasted at). Don’t forget the easiest way to get a share or retweet – ask for one! Your plan of action is now laid out. 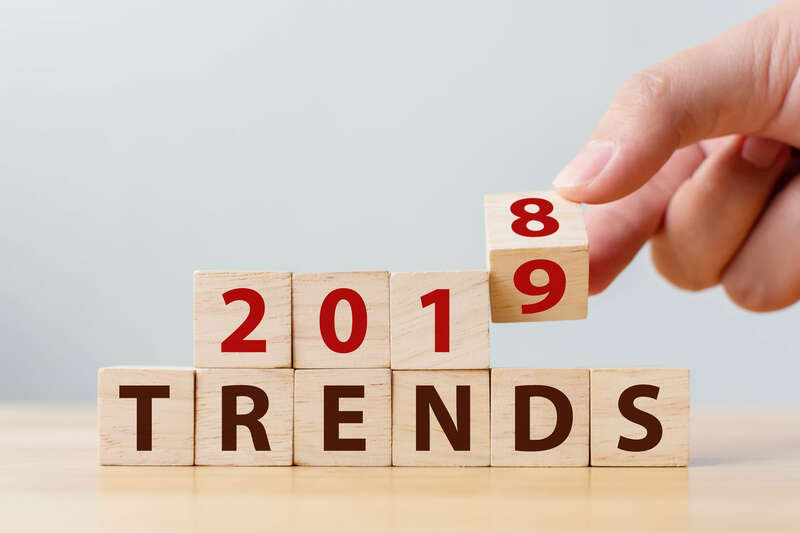 We have given you the trends that are shaping event marketing in 2019 and beyond. We have suggested how to rethink your strategy to accommodate for change and novelty. We have discussed the most modern tools you can use to revamp your offline and online marketing. The challenge is how can you use event marketing to communicate a transformative experience to your attendees. Modern event marketing delivers novelty, speed, dynamism to your event, it gets attendees excited to be part of an experience that will change them. Great event marketing cannot do anything to help poorly planned events or resuscitate bad concepts, but it is a strong driver to change them. Embracing change in event marketing, will change the industry for the better. That is why your role as event marketer has more importance today than it ever had. Keep driving the change, the future is now!